About Timex Timex Corporation is the nation's leading watch manufacturer. With a large and varied line of watches, Timex has the style for everyone. From the locker room to the board room, there's a great Timex time-piece for you. 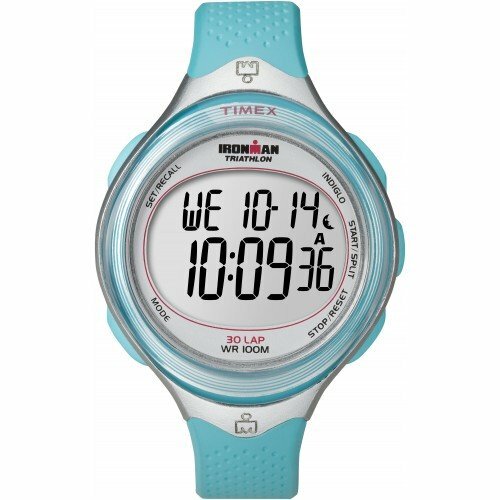 Look for Timex on the wrists of many great athletes competing in Ironman events world-wide. And like the best athletes, Timex keeps on ticking. Sporty watch is made of durable resin. 100-hour chronograph with lap/split. 10-lap memory recall and 99-lap counter. Water-resistant up to 330 ft.. Dimensions: 9L x 1.25W x 0.5H in..